Tom Beidler was a person I would have liked to get closer to. His shop was a place I could visit and find relief after my cleaning job at one of the nearby hotels. At the end of the day sometimes it was Tom that put a smile on my face while I sat there attempting to avoid brain freeze and suggesting that he start selling alcohol infused milkshakes. No matter how much Tom protested I insisted that one day it would be possible, we would get around the laws and have fun. From what I have heard and seen for myself Tom was one among many super hard working immigrants here in Finland. An immigrants who had a family, a dream and a sense of responsibility to get something done, the kind of immigrant that it seems Finnish society sometimes doesn't want to see. He was also a person so much more than just an immigrant and entrepreneur who was seemed to be doing so well that I am worried to many of us never bothered to ask if he needed help. News of his death came as a total shock, and it was a bit late too. Today is October 13th 2012 and Tom Beidler died on September 27th 2012. I just found out. His obituary is only available in Finnish on the Helsinki Sanomat website. There is no information about his death on Facebook or at the Yobot site. I can understand if his family wants privacy now, or is too aggrieved to share information about his death publicly. It feels like there is a wave of shock and sorrow about to spread through my community so I feel compelled to write as a way of expressing my condolences. When I heard about Tom's death, the first thing that came to mind was my own lifestyle and that of a few other people I know who simply can't seem to get a day off. The words ”Maybe he worked himself to death” rang through my head like a warning to slow down. Then came reflection. In the immigrant community we don't necessary think of ourselves politically as a community. We don't see ourselves as a village in which we must care for one another. We don't check in on each other or invite one another over for dinner. Maybe because we are all working so hard, or are so alienated from our own cultures and realities that we are unable to connect. It's impossible to say that we could have prevented Tom's death, but one thing about loss is that it is an opportunity for us to consider how we've cared for what remains and how we can do better. I would like to remember Tom on Halloween day. October 31st 2012 by gathering at Frobot, lighting candles and saying our goodbyes.How I've known Tom Beidler feels like Halloween, fun, kooky and sweet, now that he is gone we can return to it's origins as a day for the remembrance of the dead. Thank you so much for writing this. Tom was a dear friend of mine, and news of his death only just came to me. Thank you for your post Edna. Very insightful and heartfelt. Sounds like you and Tom had some good times. I was friends with Tom back in Portland, Oregon. He was a great soul and it was so wonderful watching his life in Finland and Yobot develop from afar. I just found out the news today via Facebook. I appreciated finding your message. I like the spirit of your idea to remember Tom on Halloween. Perhaps some of his friends in Portland will do the same. It was shock for me too. I would like to help anything I can do. I, too was shocked and saddened to hear of Tom's death. I graduated from High School with Tom, and knew him since we were around 12 years old. I stumbled upon some of his photography online several years ago, and contacted him through Facebook. He had a brilliant artistic eye, and was truly a free spirit with such an upbeat positive attitude. This world was a better place with him in it. My heart goes out to his children, and family. Nicely written, Siri, thank you for this! We are a small community of internationals here in Helsinki, and we could look out for each other more, it is true--no one else does. Thank you for sharing your beautiful memories. My condolences go out to everyone who has been touched by this loss. This is an absolute shock! What happened? Tom's son, Max, went to Opal School in Portland with our daughter. We moved away 4 years ago, but remember Tom and Jaana quite well. This is truly sad... I am so sorry. Thank you for posting your letter. 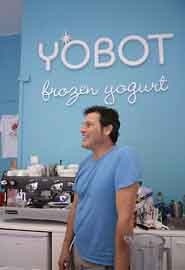 I didnt know Tom well but from the few times I visited Yobot , he was someone that always put a smile on your face. The news of his passing came as a shock. My deepest condolences to his family. Very sad news indeed. We have good memories of Tom, Jaana, Max and Emma joining us on Halloween for some neighborhood trick or treating. He will be remembered as fun, good natured, gregarious and very talented. The place is called Yobot. Not Frobot. Get your facts straight. Hey Tom's friend, I'm sorry about the spelling error, we haven't gotten around to correcting it, I'm sorry that it's offended you.